Starting Sunday at midnight, we want to see Your Best Summer Squash Recipe. This is the fourth contest Whole Foods Market will be sponsoring, awarding the winner with a $100 gift card. At the end of this 8-week summer promotion, one of these winning recipe authors will be awarded the Grand Prize: a $1,000 gift card! Our longtime partner OXO will continue to award a bounty of kitchen products to the winner and runner-up. So for 8 weeks, we're talking double prizes! We had friends over for dinner so I served this Vegetable Triage and it was a HUGE hit. The veggies were perfectly roasted, the potatoes were nice and tender and the caramelized onions were sweet and salty. The whole dish was delicious and it looked really pretty too. All of my friends loved these roasted vegetables and so did most of the kids. I am looking forward to making this again and again. I served this dish alongside the Garlic Chicken and they paired nicely together. Caramelize an onion in a pan or wok with olive oil, toss in as much sliced yellow and green squash as you like, stir it until it is as cooked as you like, toss in some chopped mint and serve with a grinding of black pepper. Even anti-squash people like it. I have enjoyed reading all the recipes and have made a few. I'm sorry it took me so long to find this site. Never too late -- glad you found us! And welcome. I agree that summer squash can encompass many varieties. Winter squashes usually have the hard shells associated with hubbard,butternut, acorn, etc. I have been growing "ronde de nice"
(some call it 8 ball), patty pan, and several space saving zucchini like cultivars because they seem to provide a good variety and mature before the dreaded squash vine borers appear.This year I have some russian heirloom discus summer squash too. I can't wait for some new ideas! I just bought some ronde de nice -- so cute! Ok, I see those green things in the pic that I call zucchini (LOL) but the theme is summer squash, don't get me wrong they go together like peas and carrots, but I like to focus on the main ingredient and I have a few recipes just for summer squash. Help me out here please with some clarification. Well, this is coming from a virtual new kid on the block, but I would venture to say anything with either or both will be fine! At least I hope so! Zucchini is a variety of summer squash, along with yellow squash and pattypan squash...so I'm assuming any and all can be used for this theme. I always thought summer squash was just the yellow one. WinnieAb I am going with you on this one. I am growing three varieties of each this year. I have these beautiful babies summer squash right now . 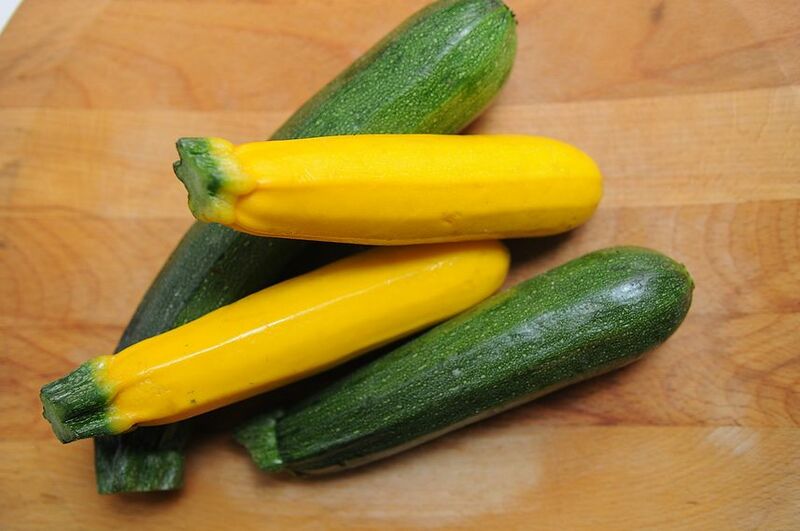 We were thinking, a la WinnieAb, that this would include all kinds of summer squash -- yellow, zucchini (even round zucchini! ), pattypans, and any others I'm forgetting. Have fun! Yes! I can't wait to enter. I just discovered the site and I'm digging it. Thanks! Glad to have you as part of the community. Well I am sad to see the week of cherries come to a close. I do like squash, but do not have any where near as much passion for it as I do cherries! LOL and I mean this sincerely. I am simply overwhelmed by the wealth of recipes you have contributed! You did a yeoman's job here this week - wow! Heena, if you notice my recipes leaned much more towards the healthy side by the end of the week for the same reason! But it was fun. It was the focus on my week! Just home from walking down to new neighborhood Farmers Market - loaded with you-know-what! I love zucchini....will be swimming in it before long...I always overplant! Actually I have something in mind, too. This may be more fun than I initially thought! Looking forward to seeing what you come up with. You have such great ideas, like your milksicles.